Do you spend hours sitting at your desk? Do you feel tightness and pain in your hips? If so, it’s time to stretch. Extended sitting aggravates the muscles that support the pelvic bowl—the hip flexors, external and internal hip rotators, adductors, abductors, psoas, piriformis, gluteus muscles and hamstrings. Our pelvic bowl joins our lower and upper bodies, which means that when our hips suffer, so does everything below and above them. Tight hips can be the cause of sciatica, knee discomfort, and osteoarthritis, as well as pain in the lower/upper back, shoulders, and neck. Even those of us born with flexibility should work consistently to maintain hip health. More than everyday comfort, open hips also help to enhance performance and safety during sports. The following are my favorite hip openers. I recommend doing these a few times a week. Hold each pose for approximately one to two minutes. Practice safely and listen to your body - hips can be vulnerable when pushed too far. Kneel on your heels with your knees separated mat-width apart and big toes touching behind you. If you experience pain or discomfort in your knees or quads, roll a blanket into a log shape and lay it horizontally in the creases of your knees (The bigger the roll, the less pressure). Then, lean back using your hands to support your torso a few inches away from your buttocks, fingers facing your body. 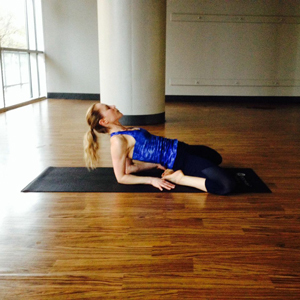 Shift into Modified Saddle Pose II, if it is available to you, from Modified Saddle Pose I: Bend your elbows and lower your forearms onto blocks. 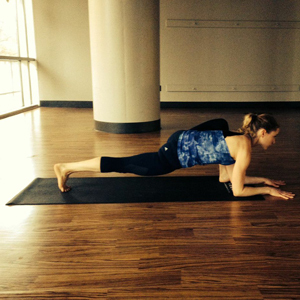 If you can go deeper, get rid of the blocks and place your forearms on the mat. Lie all the way on the ground with your arms beside your hips or resting on your belly to assume the full manifestation of Saddle Pose. Come onto your hands and knees. Step your right foot forward about an inch toward the right edge of your mat to assume a knee lunge position. Let your hips sink forward and place your forearms on the ground to support your torso (Use blocks for extra elevation if needed). Let your back soften towards the floor. After holding for one to two minutes, repeat on the left side. From modified Lizard Pose, curl your back toes under. Elevate your back inner thigh off the ground so that you are balancing on your forearms and left toes only. Hug your right knee in towards your midline. Gaze below your face or slightly ahead. Let your upper back melt towards the ground (Try not to round or curve your back). Open your legs into a V position. If your pelvis scoops backwards under your torso (a posterior tilt), fold a blanket and sit on it. Over time, work to increase the angle of your V by sliding your hips forward while keeping your legs planted in the same place. Come into a seated position with the soles of your feet together. Elevate onto a blanket if needed and use blocks for support under your thighs if they are high off the ground. Hold your feet with your hands and open them upward. Simultaneously, use your inner thigh muscles and elbows to press your upper legs towards the floor. If you can do so with a long spine, begin to hinge at your hips to assume a forward bend towards your feet (if your spine begins to round, skip the forward bend and work upright). Come onto your hands and knees. Extend your right foot in front of you balancing on your heel (If you are too high to support yourself with your hands on the ground place blocks beside your hips and rest your hands on them). Pull your toes back towards your body. If you can maintain a long spine, begin to hinge at your right hip to fold over your right leg, aiming your face to your shin. After holding for one to two minutes, repeat on the left side. From the upright half hanumanasana position, slide your right foot forward and lower your hip structure towards the mat. You will likely need to place one to two blocks under your right sit bone for support. As you become more flexible, lower your props.